Edward contemplating the newly found Bust of Aristotle! Notice the hooked nose, as the ancient said he had. This is thought to date from about 400 years after Aristotle died. Which seems like a long time, but would stil make it his earliest known likeness. ATHENS, Greece, Oct. 24 (UPI) — A bust of Aristotle believed to be the best likeness yet found of the Greek philosopher has been discovered near the Acropolis in Athens. The bust dates from the Roman era, the Athens News Agency reported. Archaeologists also excavated busts of the Emperor Hadrian and of a priest who may have been attached to the nearby Theater of Dionysus. 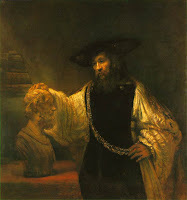 The Aristotle bust is about 18 inches high. 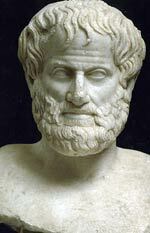 Aristotle lived from 384 to 322 B.C.